Imagination Works > English > Reviews > Review of compact standard photo-lens Panasonic LUMIX G X VARIO PZ 14-42mm/F3.5-5.6 ASPH./POWER O.I.S. 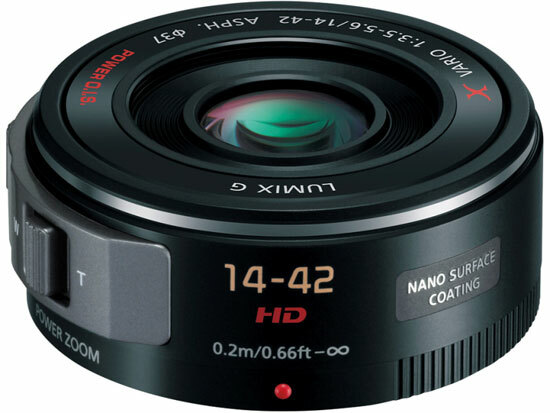 Review of compact standard photo-lens Panasonic LUMIX G X VARIO PZ 14-42mm/F3.5-5.6 ASPH./POWER O.I.S. Photo objective lens Panasonic LUMIX G X VARIO PZ 14-42mm/F3.5-5.6 ASPH./POWER O.I.S. Today in optics section we will review compact standard objective lens Panasonic LUMIX G X VARIO PZ 14-42mm/F3.5-5.6 ASPH./POWER O.I.S. It is attached to camera via Micro Four Thirds mount ( it can be used with Panasonic and Olympus cameras ). Its focal distances range is 14 – 42 mm; maximal aperture : f/3.5 – f/5.6 ( for maximal and minimal focal lengths, accordingly ), minimal aperture is f/22, it is controlled with use of 7 diaphragm blades. Minimal focusing distances are : 0.2 m ( for 14 – 20 mm focal distances ) and 0.3 m ( for 21 – 42 mm focal distances ); field of view : 75 – 29 degrees ( for minimal and maximal focal distances ). Objective photo lens contains 9 lens elements in 8 groups ( this is average value for zoom lenses ), 4 are aspherical, 2 are made of ED glass; all of them are coated with protective and anti-reflective Nano Surface Coating. It supports POWER O.I.S. ( Optical Image Stabilization ) and automatic Internal Focusing. 37 mm optical filters can be attached to it, its sizes are : 61 ( diameter ) x 26.8 ( length ) mm, weight is : 95 g. Package contains : Panasonic LUMIX G X VARIO PZ 14-42mm/F3.5-5.6 ASPH./POWER O.I.S. photo lens itself, frontal and rear caps, carrying and storage bag and user’s guide. This is quite convenient compact and light-weight objective photo-lens, with zoomable focal distance, many automation functions and adequate price. Its minuses are : small maximal aperture ( photos in low-light scenes will be dark ) and big amount of lens elements ( they disperse light and increase internal reflections ). So, it can be recommended to novice photographers or for video recording, where its light weight and automation functions are very useful.